Passed away peacefully 5th April 2019. 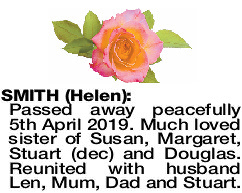 Much loved sister of Susan, Margaret, Stuart (dec) and Douglas. Reunited with husband Len, Mum, Dad and Stuart.